Berrara is surrounded by a nature reserve, an extensive rock shelf for walking, fishing and exploring and a popular surfing beach, while Berrara Lagoon offers a safe area for toddlers. Wildlife is plentiful throughout the park with two resident kangaroo families and an abundance of native birdlife. Berrara is seven kilometres from Sussex Inlet township. Please note – this beach is not patrolled. Access Seven Mile Beach via Beach Road, Gerroa. Wheelchair facilities here include: w/c parking in beach carpark, ramp to the beach lookout, undulating concrete path linking to facilities block (approx 200m) and a covered bbq area with accessible picnic tables on the southern side of Beach Road when entering the park. See Google Earth image in gallery below showing locations. During peak swimming season 7 Mile Beach is patrolled by professional life savers between 9am and 5pm. Just a 10 minute drive from Berry, 20 minutes from Nowra and 4 minutes from Gerroa. For more information see Shoalhaven Holidays. Green Patch Beach is located within the Booderee National Park. Facilities include disabled parking, wheelchair accessible pathway to the facility building (with wheelchair accessible toilet) and to the very beautiful Green Patch beach. There is a wide wooden ramp down onto the beach. The Guinness Book of Records reports Jervis Bay as having the whitest sand in the world. 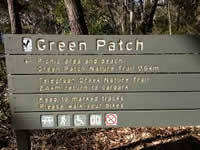 Wildlife at Green Patch includes kangaroos, wombats, king parrots, kookaburras, lorikeets and rosellas. at 7 locations throughout the Shoalhaven. At Pebbly Beach, Australian native animals and birds abound. Kangaroos graze on the grass above the beach and on the beach itself and a quite happy to be patted or to pose for a photograph. At the carpark you will likely be welcomed by flocks of King Parrots and Rainbow Lorikeets. The Pebbly Beach turn-off is about 10 kilometres south of Termeil and it is about eight kilometres over a gravel road to Pebbly itself. Facilities include a concrete/timber path down to a viewing platform at the beach and grass area. There are excellent accessible amentities adjacent to the carpark.